… and the month-long storm that caused it. Sorry its been so long. Winter has been a miserable affair this year. I got back from a weeks snowboarding in Slovakia last week. It was about -27 at its coldest over there in the dumping fresh snow. Yet when i landed back in Edinburgh I already knew it was colder, dark and more miserable here. We had heard on the saturday of the ship that ran aground at the Farnes. We followed the updates and gossip on FaceTube and also kept an eye on the weather forecast. It was bleak. – Cold. Hovering just above freezing, with gales from the East. This meant big seas. That forecast was 10 days ago, and the weather front arrived on the coast before we did. Its also looking to stay the same, for another two weeks, right through Easter weekend. So there have been some proper big days on the sea, and plenty of casualties along with it. Seals, both adult and pups have been washing up all over the beaches. Along with a wide assortment of bird; Terns, Gulls, Guillemots, Razors and even Puffins, dozens of them. Its quite sad. And what of the MV Danio ? 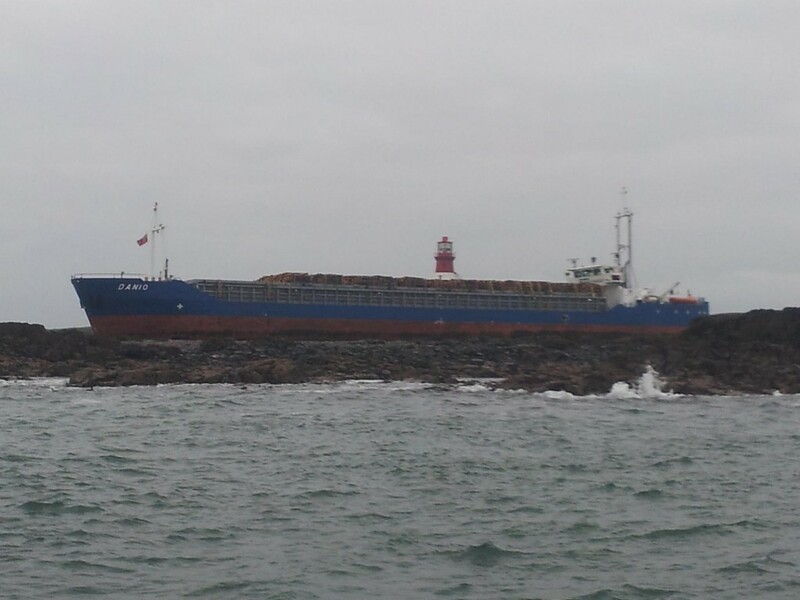 the 80m freight vessel that managed to ‘miss’ the mighty Longstone lighthouse and park herself on the rocks a mere 30m away ? Well the Danio is still there, waiting for the right tide to take her off the rock. Rumor is that they are going to move her tomorrow (26th March). A tug from Leith is moored just North of the Farnes waiting for the weather to break. I snapped a quick picture of the rope that has been shipped in to help move the 2500 tonne vesel. £20,000 worth of 6-inch thick rope…. And in the last 12 days, with seas as big as have been seen for a while, one boat has been the only one leaving the harbour at Seahouses. Stand Sure, skippered by Jonathan Dawson has been assisting the salvage team, moving people and equipment between the islands and the harbour in 6m seas… not a job for the faint hearted !